07.30 – 8:30: Optional Our shutter bus will pick you up at your hotel; afterward heading to countryside where will be host by local family and discover culture by easy cycling and rural eco such as replanting rice, scooping water for irrigation, catching fish in the afternoon. 11:00 Arrival to the village of Doan Xa, check in the room, take a rest and fresh up before lunch. 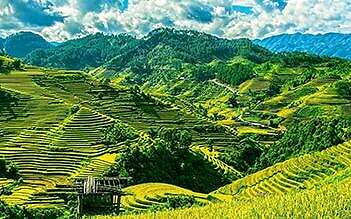 Spend the afternoon time for an exciting biking through lush rice fields and villages where we are going to learn and actually hand on rice cultivation with Vietnamese in friendly local environment. Back to the village and relax by the pond for fishing, reading book or take strolling around village learn more about local daily life. 19:30 Have dinner in Paddy Home, Dong Trieu. 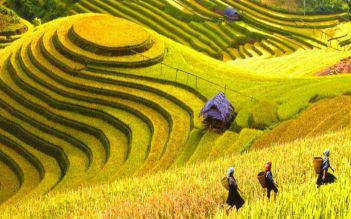 Highly recommended to get up early for a strolling around the village to enjoy fresh atmosphere and open air in Vietnam countryside. 07:30 Return to the homestay for having breakfast. 08:30 Check-out our homestay. Be ready for the next experience! While you are waiting for the shuttle bus pass by, our tour guide will take you to visit quiet little markets in town for studying about local people, leave the market we continue to see the last place where you have chance to get to know an about how pottery and ceramic are being made. 10:30 You are on the Shuttle bus for keeping travel to Halong. 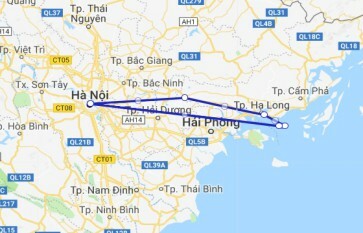 12:00 Arrive at Swan office in Ha Long, have a little time to relax and then you will transfer to Swan Cruises by tender. 12:45 Enjoy welcome drink, be briefing about safety on boat and activities included then check in cabin. 13:30 Have lunchtime while leisurely cruising to the core of Halong Bay. 15:30 Arrive to Cap La Island the beautiful area in Bai Tu Long Bay. 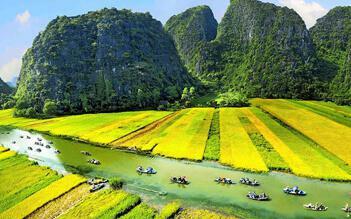 Enjoy kayaking through the karst and breathtaking nature, swimming and relaxing. 17:30: Get back to the boat and enjoy Sunset Time with tea and fresh fruits. This time is regarded as “ Happy Hour” – “buy one get one” while our cruise is sailing to the overnight anchorage. In addition, Cooking class is also organized by our guide at this time. You have a chance to make Vietnamese cuisine by yourself. 19.00: Dinner will be served in the dining room on board. 06.30: Start your day with Tai Chi on the Sundeck. Enjoy sea landscape of early morning and fresh atmosphere. 07.00: Have breakfast in the dining room on board. 07:45 Explore Thien Canh Son Cave – it is one of the most beautiful and famous cave of Bai Tu Long Bay. 09.30 Arrange your luggage and check out of your cabin. Our staffs will help you transfer your luggage directly to the pier. 10.45: Have lunchtime in the dining room on board while the cruise is returning Hon Gai Harbor. Without a second thought I would do this cruise and boat trip again. The boat is stunning and the rooms are luxurious even though most of the time you are standing on the top deck admiring the gorgeous view whilst the most friendliest staff assist you in any way they can. The activities that are offered are amazing and the guides and staff make the trip's more exciting. The price for this experience is fantastic and well worth it. If anybody is thinking about seeing Halong Bay travel with this cruise company and YOU WILL NOT REGRET IT!! !